Weekend Reflection, So Much to See! James, over at Newton Area Photo hosts a new meme called Weekend Reflections. 4)Comment on other Weekend reflections participant's blogs. I got this "fish eye' reflection in the mirror of the school bus on the parking lot of Great Falls. I've never seen any mirrors like this one before, but this looks like a very clever idea to me? By the way, this is a non edited, straight out of the camera picture. I lost access to my little notebook for now, we're going to have to try to figure out if it died on me or not. Let's hope it did not? Other than that, I'm still having the time of my life, so much to see and explore, it's really overwhelming! I had tons of fun photographing kids doing "trunk or treat" yesterday. I took a gazillion pictures. To give you an idea how much I made ... I wore out three sets of batteries on my camera and ended up making an additional 280 pictures with Melli's camera! ROFLMAO!!! This Fave Five has got to be a “quickie”. Five pictures of what I have seen here so far and what we’ve been up to yesterday. 1. Fun with our cameras. Our cameras are working overtime. We’re having so much fun together, Melli and I, and Mom tags along with us. The poor thing really gets her exercise, but she loves it. She’s sweet. I love her to pieces. They’re huge, but the most photogenic trucks I’ve ever seen. 3. And then old barns of course. I LOVE them!! I’ve seen them on other blogs before, but now I’m the one who gets to photograph them!! Not just a quick shot from a distance, but up close and personal. Every little detail matters! But you’re going to have to wait until I get home to see more pictures! I’ve got some good ones!! 4. We visited one of Melli’s favorite places yesterday, Great Falls. A BEAUTIFUL place, not just because of the wild river and the falls. Photo opportunities galore! People dressed up in old costumes, live reenactment scenes, a little bit of American heritage and history… I HAD FUN!! 5. Even going to the groceries store is fun. We went shopping for some ingredients to cook supper. Of course I have my camera ready, even in there! I would not DREAM of doing this at home, but over here I am a woman on a mission, trying to capture the essence of daily life in America. And when people ask questions, there is always Melli explaining I’m from Belgium …. I’m sure people must think Belgians are a bit eccentric. I used to think the exact same thing of Americans…. More Fave Five posts at Susanne’s Living to Tell the Story. The first day of the big adventure was a travel day. I met Korie at Brussels airport two hours before we were supposed to check in. She guided me through all the airport procedures.We tried to get our seats swapped when we checked in, but ended up in separate chairs after all. We did get plenty of time to get to know each other better but then again, bloggers already KNOW each other, so it felt more like old friends catching up , really. The flight was pretty uneventful, I sat next to a lady who hardly spoke a word, and behind a tall guy who kept leaning all the way back in his seat. It was a bit bumpy here and there, but nothing major. We landed half an hour earlier than planned, which was cool. I got all my fingerprints taken at customs, but that’s just normal procedure when you arrive here. It will be interesting to see if they’re going to want me to that again when I proceed my travels? LOL! Anyway, I even got my suitcase back and I was all bright eyed and bushy tailed and ready to meet Melli at the exit. Only, when I came out, there was no Melli. Nobody carrying a sign with Jientje or “Bombshell” like I imagined there would be. My cell phone does not work here, and I did not have a go phone yet either, so I’ll admit, I did feel a little disconnected! To make a long story short, I discovered there is always a friendly person and a helping hand for you somewhere. There was this very nice lady I met who called Melli ( thank you so much Ma’am!) Melli turned out to be held up in traffic and parking the car way down the other side of the airport. I spotted her even before she saw me, she had Mom struggling behind her trying to keep up. Well all is well that ends well, we found each other!! We got into the car, ready to face the rush hour traffic, but the roads were not nearly as busy as we expected them to be! So Melli then just made a few detours and wrong turns, paying toll for the same couple of hundred yards like three times over before we got home! But I was sitting next to her having the time of my life and I was in awe!! “Look at that barn!” “Wow that truck is HUGE!” “Wow look at those colors!!! “It’s BEAUTIFUL!!! I cannot imagine why Melli usually says there is nothing to see where she is, I think she has no idea how beautiful it really is!! Her house is lovely and warm and bright and colorful and all things Melli! l feel so welcome here! We had a lovely meal together. Melli made a delicious Chili, there I was with the whole family at the kitchen table, it was so homely and warm, this is more than I ever dreamed of. I get to see the real people, life like it is, and I’m having the time of my life here! I slept like a rose, with the sound of the crickets in the background, and even the little birds I hear in the morning sound different than mine do at home!! … and our cameras ! See you when I get there! For you, travel is less about where you're going - but who you're going with. It's no fun to experience an amazing city or a beautiful beach without your friends. In fact, it doesn't really matter where you go... because you and your friends always figure out how to have fun! You've done a good bit of worldly exploring, and you have an international perspective. And you're definitely looking forward to your future adventures abroad. You've got the passport, the desire to travel, and maybe even the language skills. Now all you need are the means! You see companionship and loyalty as what's most important in life. You live a life of leisure. You take your time in every aspect of life and enjoy it to the fullest. You are all about risk and randomness in your life. You travel off the beaten path... in fact, you're often the one carving the way! My beloved daughter bought me the cutest birthday present I have ever seen. A beautiful Italian Princess who wants to live in my kitchen. She wants to be my personal cheese grater. and I love her, she's so cute! I got another little present I will treasure even more. … was eleven years old. My daughter Valerie threw me a birthday party on Friday evening. I’m so proud of her, she made the starter and it was delicious!! Time passed much too fast. Before we knew it it was past 3 AM! Thanks Valerie and Pieter, you two gave me a fabulous Birthday party! The castle at the municipal park is at walking distance from where I live. The last Fave Five before I go! This is the last Fave Five post I’m going to be doing from Belgium. The next one - if I get around to blogging much which I’m not sure just yet – might be about Halloween and all kinds of pumpkin stuff. And all things Melli of course, since she’s my first host!! I’ll have to see what I can do once I’m traveling. I’ll try to make at least a small update of what I’m up to. We’ll see how it goes. I was thinking of planning a couple of my favorite old blog posts that might be worth digging up, like the story of my nickname and stuff. Just thinking, we’ll see? If I can find enough time, and Blogger is not out or acting up like it did this morning. Anyway, stay tuned, keep visiting? This was my last week in Belgium and it was also my birthday week. Very hectic and a little bit chaotic but very good! 1. I’ve got the tickets and the reservations and all the paperwork I’m going to need to travel! This is getting very very close now! 2. My things to do list is now down to a little bit of housework and … getting ready to start packing! Most of the shopping is done, the laundry is done, there’s food in the freezer and the house will be clean when I leave. I don’t know, it’s a comforting thought, it sets my mind at ease knowing everything is taken care of. 3. Julie and Julia. The movie was finally out in Belgium and I have been looking forward to see it ever since I first saw the trailer. By the way this video also contains a mouthwatering lobster recipe. Somehow most of the videos were made unavailable for embedding, but oh well, the recipe in this video is a real bonus! I can see why this movie is such a huge success in America. I’m not sure if it’s going to be that much of a hype here in Europe. The movie theatre we went to was almost empty Saturday afternoon? But if you’re a blogger and you love to cook and you love Meryl Streep as much as I do this is really a must see. 4. My birthday! I don’t care much about the actual birthday itself. Just like Christmas and New Year’s day and all that stuff, I do not really care all that much about it. Any day is just as special to me, and sometimes they even mean a lot more. But all the ecards, comments on my blog and on Facebook, cards in the mail and what not really made me feel very special. And tonight I get to celebrate it again! We’re invited at my daughter Valerie’s house this time! Yup, that’s what you get if you have two daughters, you get to celebrate everything twice!! ROFL! 5. And then there is something very very weird. My first English speaking American Blogger friend ever Lilacspecs, - she’s the one who got me blogging in English on Nablopomo in the first place and she lives in Belgium now - **gasp** any way, she will be flying to Pittsburgh next week to visit her parents. I asked her when she would be leaving and she emailed me she’s flying to Washington DC on Wednesday morning and then leave for Pittsburgh from there. Turns out we’re on the same flight!! WOOT!! We haven’t met in real life before, so can you imagine what this means? This trip is going to be a blogger meeting from the very beginning! ROFL!! Life can be full of surprises sometimes, can it!! The sound of heavy rain on a metal carport roof. A tropical storm, nothing compared to Belgian rain. I was listening to a Hawaiian rainstorm. I “met” the mellifluous voice behind a blog URL and a profile picture . We talked and talked and laughed for almost an hour and there were never any awkward silences. At least, as long as the headphone was plugged in the right way, there were none. And as long as the storm did not nibble at the Internet connection. She cracked me up with her funny sense of humor. I even overheard a He said/She said conversation. Those are REAL, I heard them! I just KNOW I’m going to love meeting them. Different voice, much lower this one. A slight smoker’s cough when he bursts out laughing. Aaaah??? Nope, he has not given up smoking yet. I even caught him light one. LOL! Yeah, that’s what you get when you make a video call! Thom is the same guy he is in his comments. Good humored, very thoughtful and always ready to lend a helping hand. Now I KNOW he’s going to hate me for saying this, I think I might be destroying his evil image, but I don’t care! I was talking to my friends Quilly and Thom through Skype and it brought us even closer together. Meeting them - along with all the other friends I’m going to see - for real is going to be the most wonderful thing. Having to say goodbye will break my heart, I already know that now. That’s why it’s a such a comforting thought I’ll still be able to talk to them and see them once my trip is over. 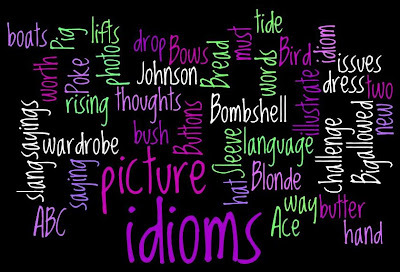 This is the last Idiom Wednesday. and I think we all had a ball. Have a ball : have fun, enjoy yourself. I know I did. I’ve loved watching all your pictures each week. Your creativity and resourcefulness made me chuckle sometimes. Only now it’s time to move on. I can’t wait to see what you’ll come up with this last time.. Please add your link to Mr Linky if you’re playing! October twentieth today. That’s a very special day for me, because it is my birthday. From this day on I’m 52. It’s funny but I feel a lot younger now than when I was 25. I may not look better, but it feels better in my head. Oh well. Mother Nature always tends to compensate things for us, haven’t you noticed? Anyway. I KNOW it’s going to be a good day. Thanks for the emails and ecards and wishes on Facebook on text and by mail. I’m overwhelmed. My hubs is taking the afternoon off today. I’m really looking forward to spend some time together, only one more week left before my departure. After that, the poor guy is going to have to miss me for three whole weeks. Wednesday next week I will be leaving for Washington DC, where Melli will pick me up at Dulles International Airport. I’m very much looking forward to celebrate Halloween and learn more about this popular but very American event. Halloween is slowly finding it’s way to Europe but things like pumpkin carving and trick or treat will have a different ring and feeling to it than it has over here I think. I’m really looking forward to the time I’m going to spend with Melli and her family. I will also get to meet my future travel companion Ella. Ella has seen more of the world than any of us. Thom invited Ella to Hawaii, and I’m going to take her there, and then take her to Europe afterwards. Keep her out of trouble. And TRY to stay away from ditches. Ella is a real dare devil so I’m going to have to keep an eye on her! Anyhow. I’m not sure how embarrassed I’m going to be traveling with a toy elephant, ( yes! ROFL!) but we’ll see. It’s going to be TONS of fun, and giggles . I KNOW. Four days with Melli are going to be over much too soon, I already know that now. On Nov 2nd Ella and I will be flying over to Portland where Terri is going to show me the beautiful coast of Oregon. I’m SO looking forward to see the lighthouses and the ocean, I can almost smell the sea as I write this. Silly girls with a camera and lots and lots of stuff to explore and to talk about. I know I will hate to say goodbye to her too. After that I’m heading for LA. I won’t see much of LA though, because I will be boarding the next airplane to Honolulu, to visit Quilly and the Amoeba and Thom. I will be staying at Quilly’s for a week and we will explore the beautiful island of Hawaii’. I’ll get to soak up some sun, I’ll see breathtaking sunsets and sunrises, exotic flowers, birds and what not … Awww. Wonderful. One week later, I’ll be flying to Chicago. I hope I' will not be too jetlagged when I arrive, it’s a night flight and there will be a huge time difference. I have no idea how this is going to affect me, but we’ll see. There are plans for a blogger meet up but I don’t know the details yet. Lou promised to be my guide in Chicago and he is taking care of that part for me. Lord knows whom else I’ll meet !! What I already DO know is I am going to meet Lisa as well. Yes, THE Lisa from Lisa’s Chaos !!! I’m very excited about that too! I’m a very big fan of hers, she’s a wonderful photographer and we’re planning to make a photo walk together, and then probably have lunch together. Can’t WAIT! Even though this will mean the end of my trip will be in sight.